Most children are back in school for the year. Motorists might be grateful that teens with licenses will soon be off the road, thus reducing traffic. But school also can lead to congestion and accidents in and around campuses. 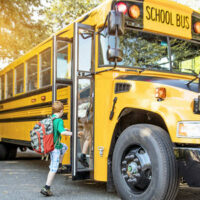 Helpfully, the National Safety Council has released a list of safety tips for drivers to follow now that school is back in session. Below, we summarize some of the most important. When you stop at an intersection, don’t block the crosswalk. Stop for crossing guards, and wait for them to signal when you can go through the intersection. Pay extra attention whenever you are approaching a school zone. Even if you have the right of way, stop for pedestrians. Always use turn signals when in a school zone so that pedestrians will know your next move. Always stop for a bus that has its yellow lights on. It is illegal not to. Stop at least 10 feet behind the school bus so that you will not risk hitting a child getting off the bus or one who shoots into the street to board the bus. Give yourself more of a cushion when following a school bus. Stay alert for children to behave erratically when getting off the bus. They might dart out in front of your vehicle. Try to avoid dropping your children off across the street from the school. This makes them have to cross traffic, which increases their chances of getting hit. Never double park, since that decreases visibility for everyone. Pull in and out carefully. There are probably many children milling around who you might not see. Always look over your shoulder before backing up. Failure to do so is negligence and could cost you if you are involved in a collision. Finally, if your children drive themselves to school, share these safety tips with them and talk over them. Young drivers are prone to accidents as it is, and the hectic nature of a school zone only increases the danger. Our Daytona Beach car accident lawyers at Bundza & Rodriguez, P.A. have helped countless injured motorists receive compensation after a collision, and we are anxious to put our experience to work for you. If you have been involved in a wreck, please call us. We are pleased to offer a free initial consultation, which you can schedule by calling 386-252-5170.